The board of scandal-hit Volkswagen meets on Friday to shake up its management. On the agenda will be choosing a replacement for chief executive Martin Winterkorn, who resigned on Wednesday. 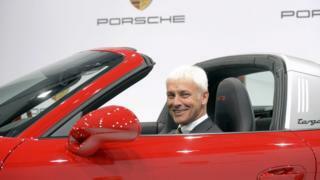 Reports have said that the front-runner for the top job is Porsche chief executive Matthias Mueller. VW is also expected to dismiss executives tainted by the scandal over the rigging of emissions tests by software in its diesel cars in the US. Some investors have suggested that appointing a new chief executive only two days after the old one resigned might be rushing things. Sasja Beslick from Nordea, which is one of Volkswagen's biggest investors, told the BBC: "I think this is just a panic reaction from the board of the company." But he added that there could be benefits from a quick appointment. "They really need to reinstate the trust of the markets and one of the potential best ways of doing that is to appoint a new head and try to tie all the bad or irresponsible things to the old one." It is also being reported that VW may be discussing changes to its corporate structure. I'm a VW owner - what should I do? Car emissions tests: Not fit for purpose? Also on Friday, further details of the brands and locations of the 11 million cars involved in the scandal are due to be set out. US authorities found that software in a particular diesel engine used by Volkswagen could detect when it was being tested and reduce the emissions produced. It meant that the emissions in actual driving were considerably higher than those found during testing. German Transport Minister Alexander Dobrindt has widened the vehicles known to be involved, saying on Friday that the rigging of emissions tests involved light vans and not just cars. He also said that cars with 2.0 and 1.6 litre diesel engines were involved and that they were also discussing whether 1.2 litre engines were. He added in a speech in the Bundestag that around 2.8 million vehicles in Germany were affected. On Thursday, the UK regulator announced that it would be launching its own investigation into emissions testing. The Vehicle Certification Agency plans to re-run lab tests where necessary and then compare the results with emissions from "real-world" testing conditions. The European Commission has already agreed a Real Driving Emission (RDE) test procedure, which it will introduce next year, but it has not yet decided what to do if there is a significant different between lab tests and RDE tests. Media captionAs Richard Westcott reports, the scandal "shows no sign of slowing down"
The VW board is meeting. So what can we expect? A new chief executive for a start, and the name on everyone's lips is that of Matthias Mueller, the Porsche CEO. There are others in the frame, but Mr Mueller is the clear favourite. On the other side of the coin, more heads will roll. Four names are being bandied around in the German press and they are all very senior people. Following the resignation of Martin Winterkorn earlier this week, it's looking like a major bloodletting exercise. And VW tell us we should get more precise details about which brands and models carried the so-called "defeat switch" designed to get cars through emissions tests, while allowing them to spew out illegal levels of pollution. So yes, it could be quite a day here in Wolfsburg. Matthias Mueller comes from an engineering background and certainly knows the brands involved, having joined VW-owned Audi in 1977. He was put in charge of all vehicle projects for Volkswagen in 2003. He is seen as a likely successor because he is popular with the families that control VW. He was already being cited as a likely successor to Mr Winterkorn in April, during the power struggle with then-chairman Ferdinand Piech. Porsche is owned by Volkswagen, but confusingly, VW itself is controlled by Porsche SE, the holding company, which Mr Mueller is already on the board of. Another potential successor is Herbert Diess, the current head of the Volkswagen brand. Mr Diess only joined VW from BMW in July, so will not be tainted by the scandal. He had a reputation for cost-cutting at BMW, having worked across the group, including a spell at BMW's Mini plant in Oxford. Given the losses already expected as a result of the emissions scandal, cost-cutting is likely to be a priority. If the board decides to look outside Volkswagen it may consider Elmar Degenhart, chairman and chief executive of the tyremaker Continental. Being head of a supplier to the car industry means he would be safe even if the investigations sparked by the emissions scandal were to extend to other car companies. Hans Dieter Potsch, who began his career at BMW, is chief financial officer of both Volkswagen and the controlling Porsche SE. He was tipped earlier this month to become the new chairman of VW, replacing Ferdinand Piech, although he could not do so until he had been elected onto the supervisory board by shareholders in November. His reported board-level support for the post suggests he could also be brought in as chief executive. Rupert Stadler heads up VW's Audi brand, and is the third of the big brand-bosses in the frame to potentially be the next overall chief executive. Being in charge of Audi also puts him in control of Ducati, Lamborghini and a chunk of Bayern Munich football club. Before the emissions scandal he was being tipped as a possible replacement for Hans Dieter Potsch as chief financial officer. He is unusual among the frontrunners because he comes from a finance background instead of engineering.